Many of you have asked for it, so I've finally done it! 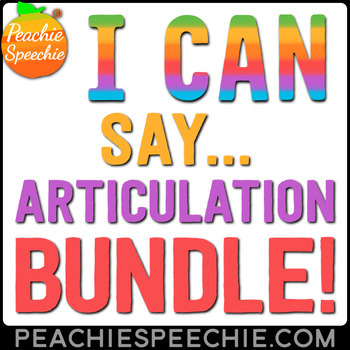 Here is a BUNDLE of all of my I Can Say articulation workbooks. Fun and engaging worksheets for articulation therapy. Each workbook has professionally illustrated, step by step instructions for sound production and opportunities for practice in isolation, words, phrases, sentences, and oral reading. You can print the entire book and bind it, or you can print pages as you go for individual students. See the descriptions of each product for a detailed look at what is included. There are 9 books currently included and we aren't done yet! Note: This bundle includes my I Can Say articulation workbooks. The I Can... Language Skills Bundle is sold separately.